Most of Wednesday evening has been dry, but cloudy. A stationary front south of Rockford has been the focus for developing showers and isolated thunderstorms. 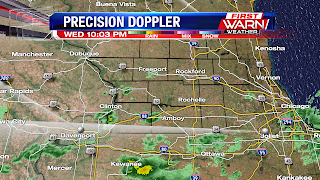 These showers are forecast to continue to shift north and northeast during the overnight, becoming more widespread over northern Illinois after Midnight. Low pressure moving into northern Missouri will move near St. Louis overnight and then into west-central Indiana by Thursday morning. The low will then strengthen once reaching Indiana, allowing more snow to wrap in over parts of northeast Illinois and southern Wisconsin mid-morning Thursday, before moving into Michigan and Indiana. Temperatures will remain in the 30's for the start of Thursday, but should remain above freezing. There is a chance that before the precipitation ends mid-morning that snow could become mixed with the rain, but any significant accumulating snow should remain further east. Either way, plan for a messy commute Thursday morning. 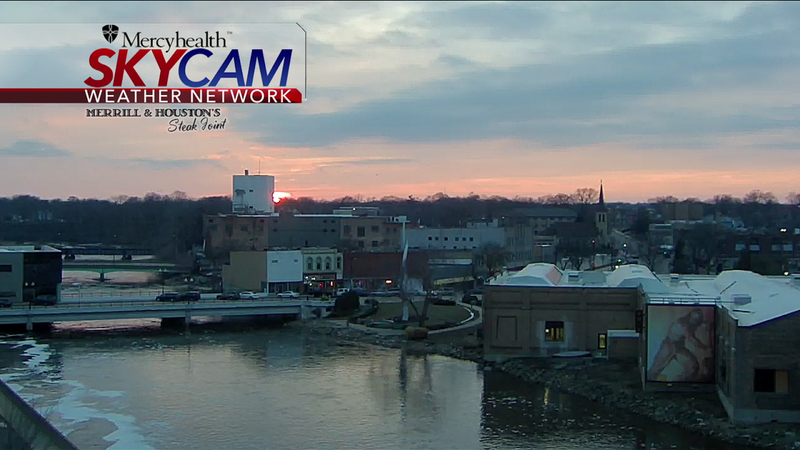 Skies will turn dry by the afternoon with temperatures warming into the low 40's. The high temperature Wednesday soared into the low 60's for some in northern Illinois. In Rockford, the high reached 62 degrees, which tied the previous record of 62 degrees set back in 2016. 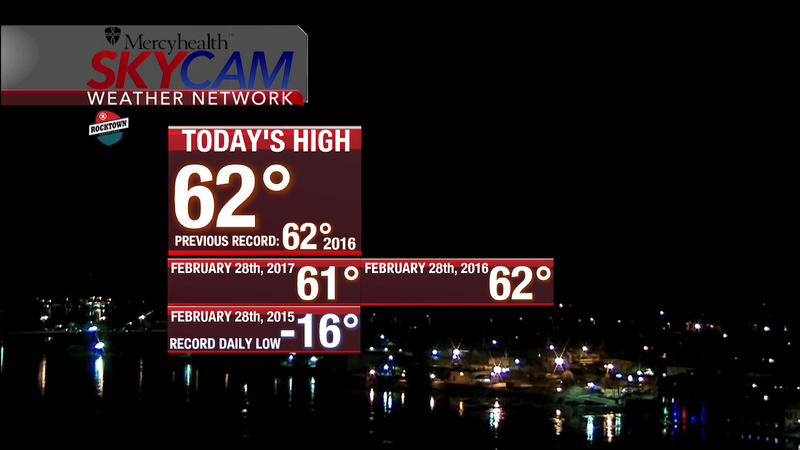 Not only that, but today was the 3rd straight February 28th with a high temperature in the 60's. On February 28th, 2015, the record daily low temperature was achieved when the mercury dropped to -16 degrees! Temperatures continue to fall this evening following the passage of a cold front. Overnight lows dip into the mid 30's with rain moving in overnight. Wednesday's cold front was a lot different than a storm system that moved through much of Illinois February 28th, 2017. It was one year ago today that a deadly tornado outbreak occurred over northern Illinois, killing two people and injuring 14 in the Naplate-Ottawa area in LaSalle County. Closer to home an EF-1 tornado did damage outside of Oregon in Ogle County a little after 5pm that evening. Click on the following links for more information on the tornado that went through Ogle County, as well as the tornado outbreak that occurred over northern Illinois that day. March in like a Lion? 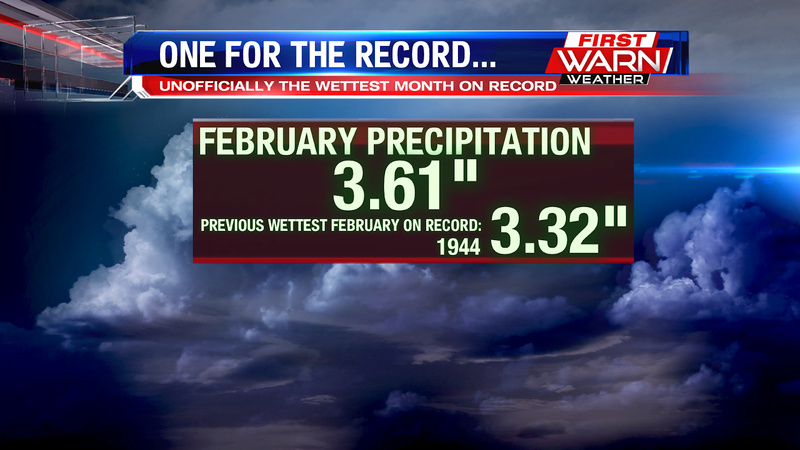 We end February on a relatively nice note. 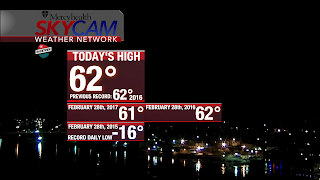 Tuesday afternoon was picture perfect with highs climbing to 60° and mostly sunny skies. Cloud cover thickens through this afternoon, but it will still be a relatively dry and mild day. Highs will climb into the low 50's with a slight chance for a late day shower. However things change tonight, and the forecast turns a bit more messy and challenging tonight and into tomorrow. 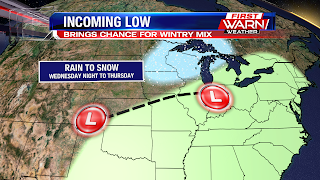 An incoming low pressure system will bring a threat for rain and snow over the next 36 hours. With a stationary boundary over the Stateline, clouds will increase with a slight chance for a few showers late today. 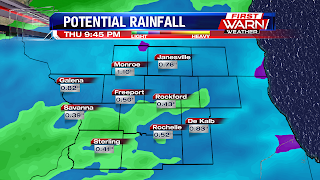 Steady to moderate rain will be likely tonight through early Thursday morning, and could lead to decent rain totals across northern Illinois and southern Wisconsin. By tomorrow morning we could see about .25" to .75" of rain fall before temperatures cool enough and the rain transitions to snow. Models have had a tough time handling this system, and the strength of the low pressure system. The strength of the low, and the moisture and cooler air it tugs in will have a big impact on how much snow we get, if any at all. The current forecast holds relatively minor snow accumulations for the area, around one inch for many. But this can definitely change as we continue to fine tune the forecast. Overall you'll want to plan for a messy Thursday and you'll want to grab a coat and boots, since you'll even have to trudge through either puddles, some snow, or both. The good news is, the precipitation won't last all day. The majority of it will be out of the area around noon to 1pm. 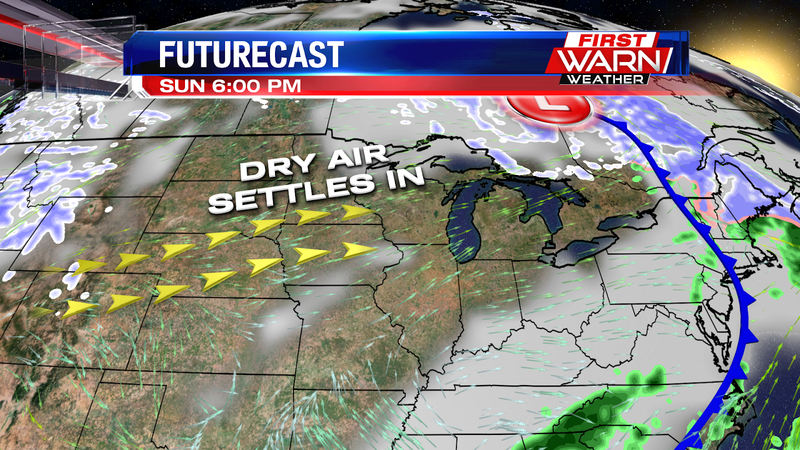 After that, dry air moves in quickly and will allow for quickly clearing clouds for the afternoon. It will be a chilly first day of Meteorological Spring, with temperatures falling into the 30's through Thursday and northwest winds will increase, at times gusting near 30mph. Then temperatures climb into the 40's again by Friday with more sunshine. Spring fever is in full force today! 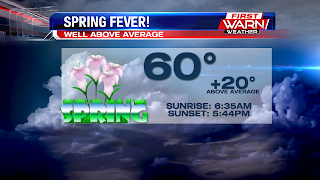 High temperatures are forecast to climb 20° above the average for this time of year! Mostly sunny skies and a southwest breeze will help temperatures climb into the upper 50's and low 60's by this afternoon. And as we know, the days have been getting longer and longer, so we get to enjoy the sun through almost 5:45pm this evening! Unfortunately the warmth won't last, as our next system will bring cooler temperatures and a chance for rain and potentially winter like weather. 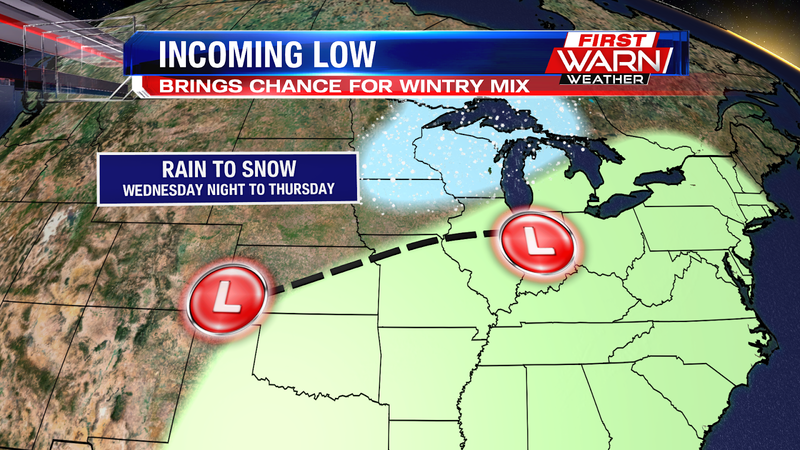 Low pressure will develop over the Oklahoma pan handle and will lift over northern Missouri and over central Illinois. 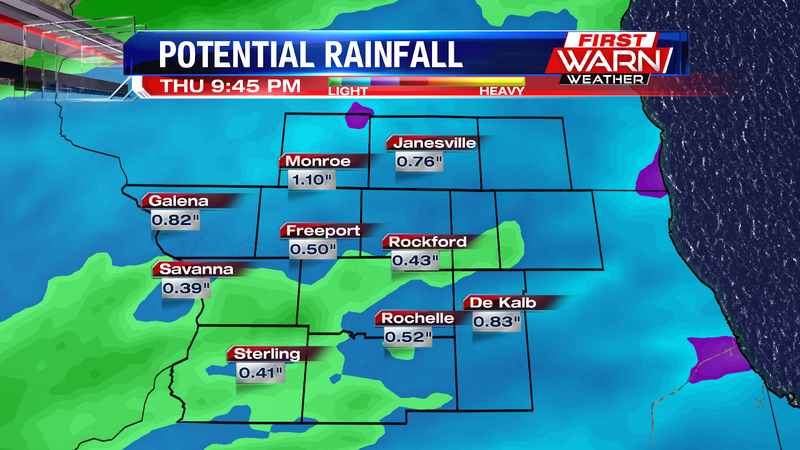 The heaviest rain potential will stay south of the Stateline on Wednesday, but we can't rule out light showers Wednesday morning and then overnight into Thursday morning. Temperatures will fall on Thursday behind the departing low, which could allow for the rain to change over to a mix or even all snow. 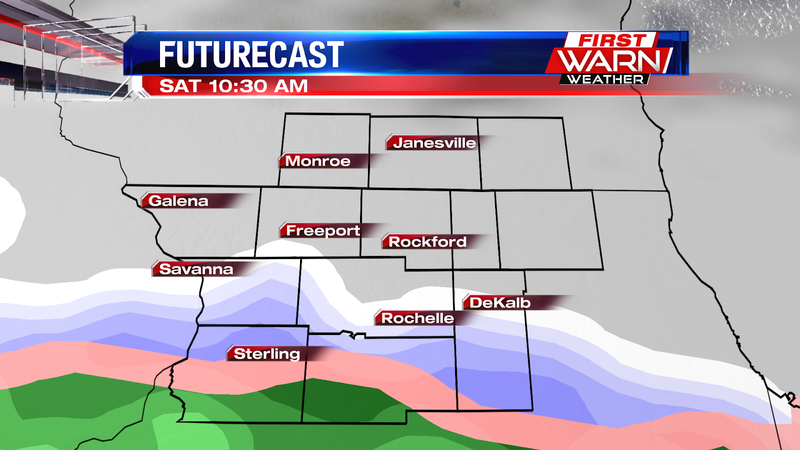 This could bring relatively minor accumulations to the Stateline. With fairly warm temperatures, the snow would be a slushy heavy type snow, that could bring slick roads through Thursday. The good news is, sunshine and mild temperatures return Friday! 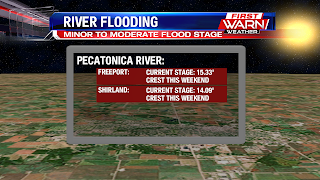 For many living along the Pecatonica and Rock Rivers the past week has been very stressful. From record breaking rainfall, rapid rises in water levels, to significant flooding, many residents just want to know when the water will fall below flood stage. 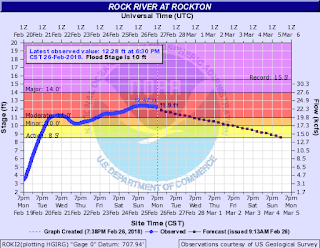 Unfortunately, for both the Pec and Rock Rivers they will remain in flood stage until the end of the week, possibly into the weekend. 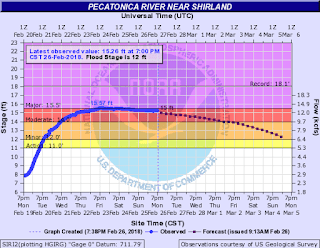 The good news is that the river has crested, or is in the process of cresting, and will begin to recede as early as Monday morning. 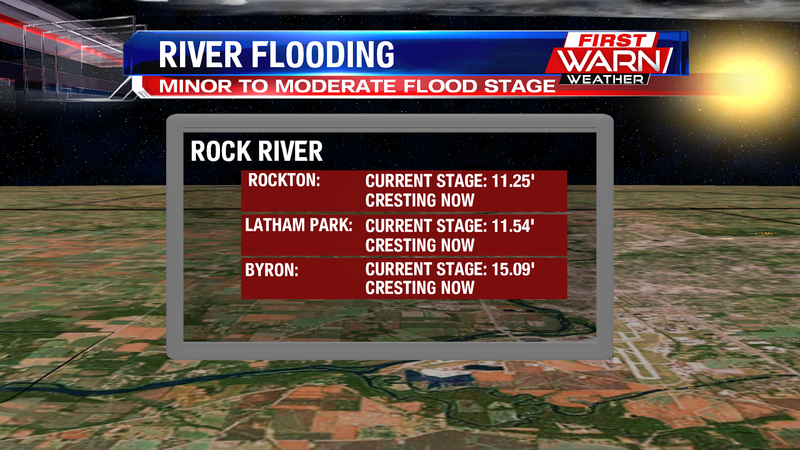 Both the Pec and Rock Rivers are reported in 'Moderate Flood Stage' as of Monday night. 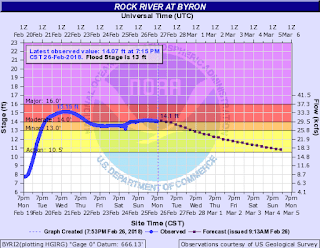 Below are the hydrographs (graphs showing observed and forecast water levels) for the Pec and Rock Rivers at various locations. 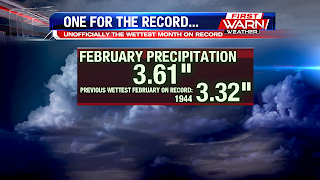 It's no surprise that with all the heavy rain and snow this month that February 2018 will go down as the wettest February on record - and the month isn't even over with yet. Saturday's rainfall pushed the monthly precipitation total up to 3.61 inches, breaking the previous record for the wettest February which was 3.32 inches set back in 1944. Skies will remain dry through most of Tuesday, but showers do develop with a cold front Tuesday night and early Wednesday. Lightly scattered showers are possible on Wednesday with a more steady rain Wednesday night. Snow is possible Thursday, but Thursday is March 1st and the beginning of Meteorological Spring. Unfortunately, it might not feel much like it. 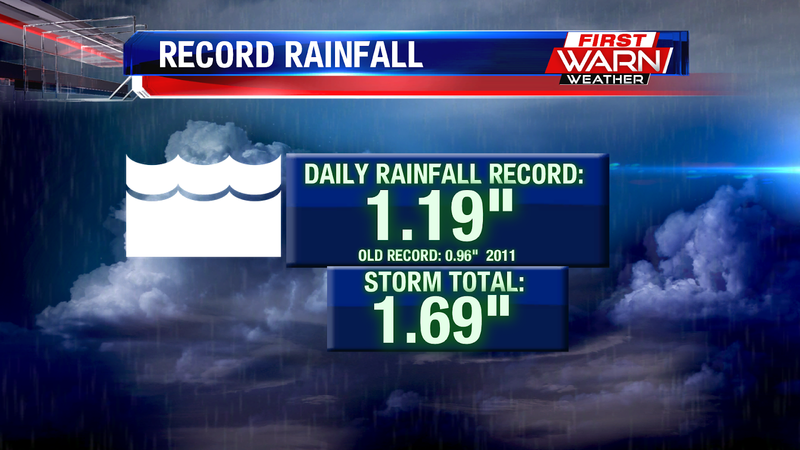 It feels like we've been dealing with rain the entire week, and unfortunately the start of the weekend was no better. We've seen isolated showers move through this afternoon, but we'll start to see some heavier showers move in after 7pm. On top of that, all the moisture is allowing for some dense fog across the Stateline, which will stay with us alongside the showers. Luckily, these heavier showers won't last that long, as they'll begin to die back down to lighter rain as we get closer to midnight. After midnight, we'll have a little lingering light rain over the eastern portion of our viewing area, but then everyone will be dry by 3am. The dense fog will also decrease in density around midnight, but we'll get some patchy fog lingering into the overnight. On top of all that, we've got windy conditions coming up during the overnight, winds will be between 20-25 mph by around 2am, gusting to as high as 35 mph. Winds will start slightly dying down once we get into Sunday morning, but will still stay a little breezy during the day between 15-20 mph. However, even though it'll be a little breezy on Sunday, we'll have a beautiful weather with sunshine and the mid 40's during the afternoon. Even though the weather is going to get nicer heading through the beginning of next week, many flood areas won't see regular water levels until the end of next week. Some areas are starting to see receding water levels, but there are a couple areas where water levels are at major flood stage levels, and where water is still rising. 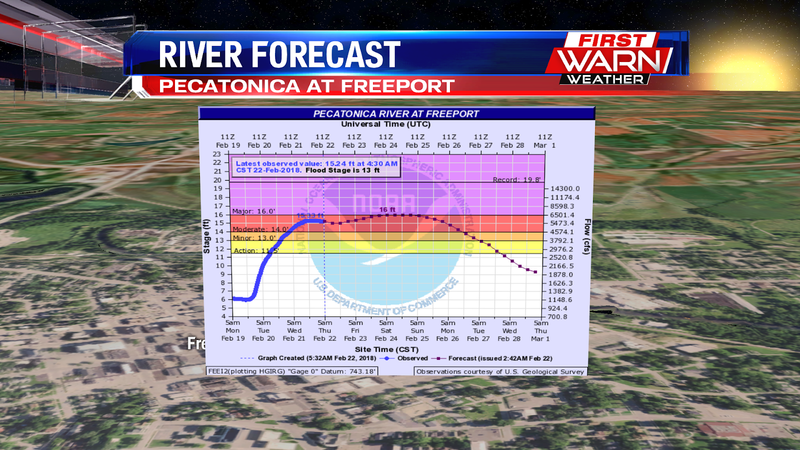 One of these areas is the Pecatonica River out in Freeport, which is at 15.7 feet currently at its major flood level. 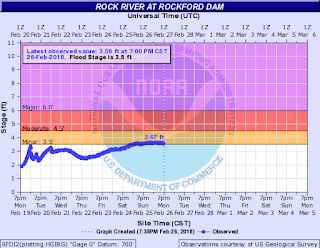 It'll continue to rise to around 16.3 feet, before falling back down as we head into the work week, returning to normal water levels by the end of the week. 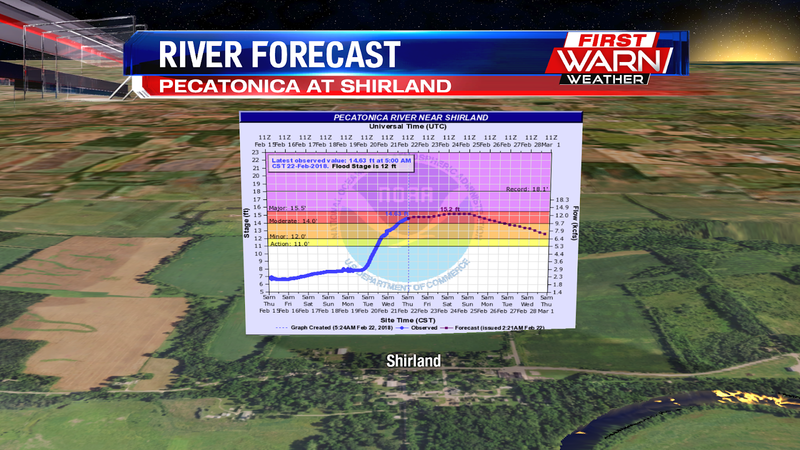 The other area is the Pecatonica River out in Shirland, which is at its major flood levels, sitting at 15.5 feet. It'll stall at this level for the rest of the weekend, beginning to fall once we get to Monday. 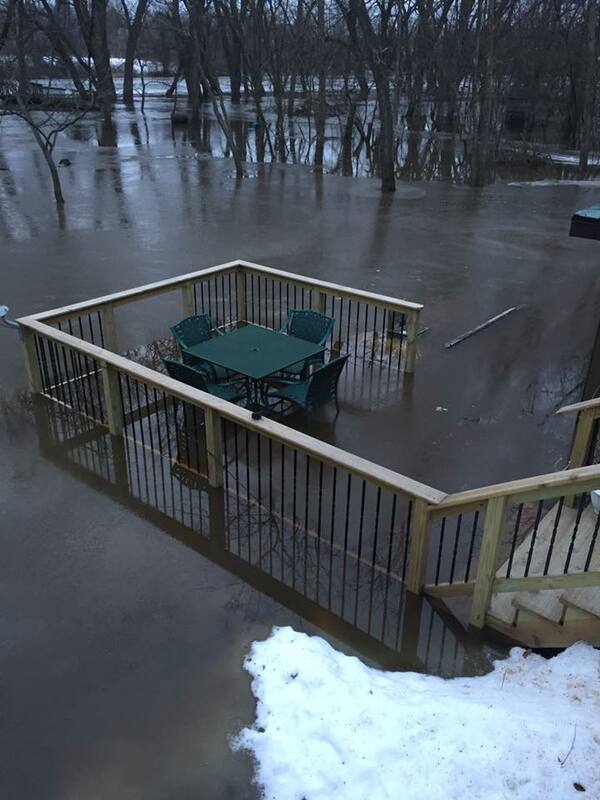 This area will take the longest to recede, as water levels aren't expected to return to normal until next weekend. 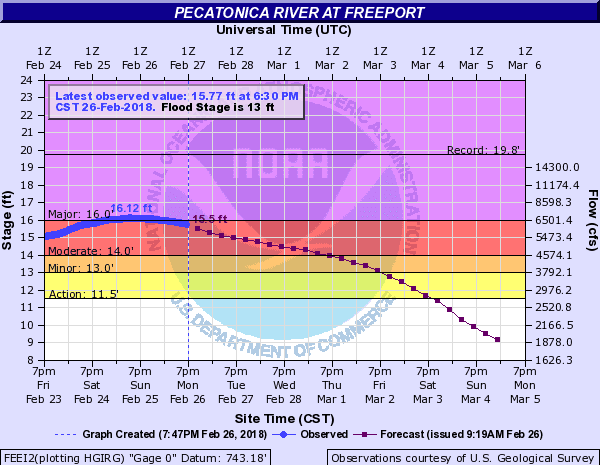 Keep in mind that these river level forecasts are based on current conditions. The rain that we've got moving through tonight, especially the heavier rain, may delay these areas even further in seeing regular water levels again. 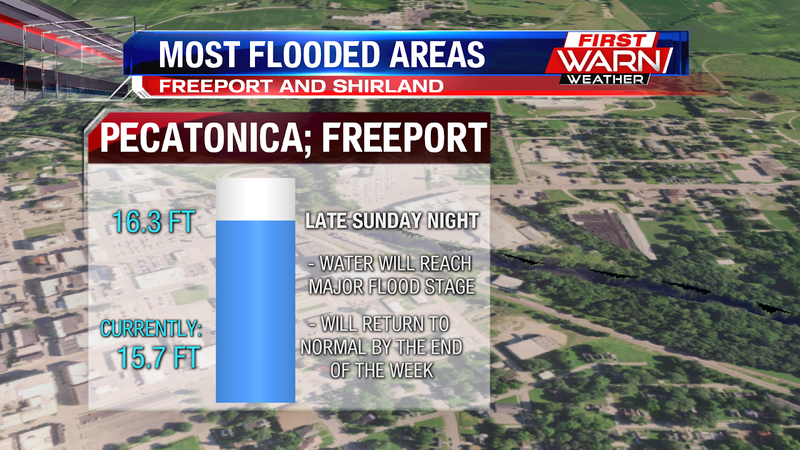 So if you do live out near the Pecatonica, especially over in Freeport and Shirland, do continue to drive cautiously when near the river, and continue to avoid flooded roadways, because we may be seeing high water levels for the next several days. 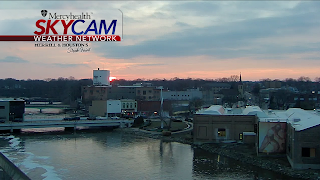 After a week of gray weather, we did manage to see a brief clearing up in Beloit, allowing us to capture a beautiful sunset; a nice way to end the week. We'll keep that cloud cover heading through the night, which will help our temperatures from cooling off too much. We'll only cool to the mid 20's during the overnight, where some patchy fog will be possible too. As we head through Saturday, any fog that forms will die down by mid-day, but we'll still maintain cloudy skies heading into the afternoon. 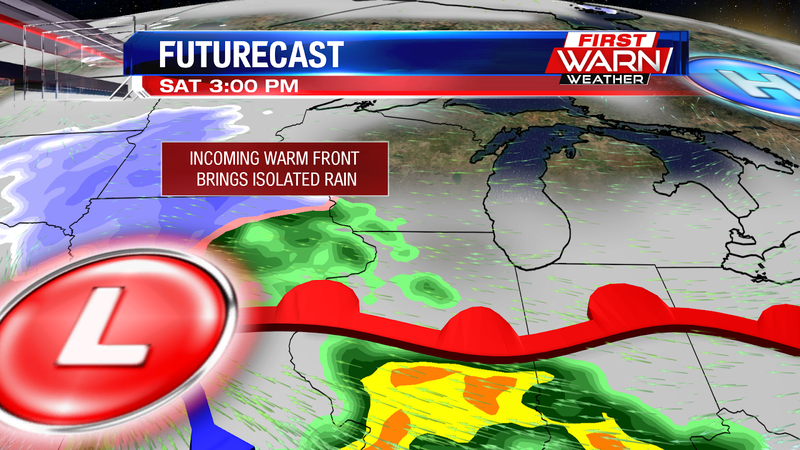 A warm front will move near our area, bringing us isolated rain showers through the area late afternoon. 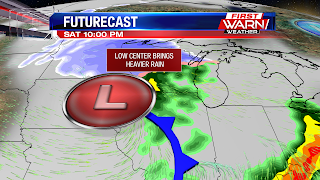 Once we get into late evening on Saturday, that low pressure center will move over the Stateline, bringing us chances for heavier rain showers heading into the night. 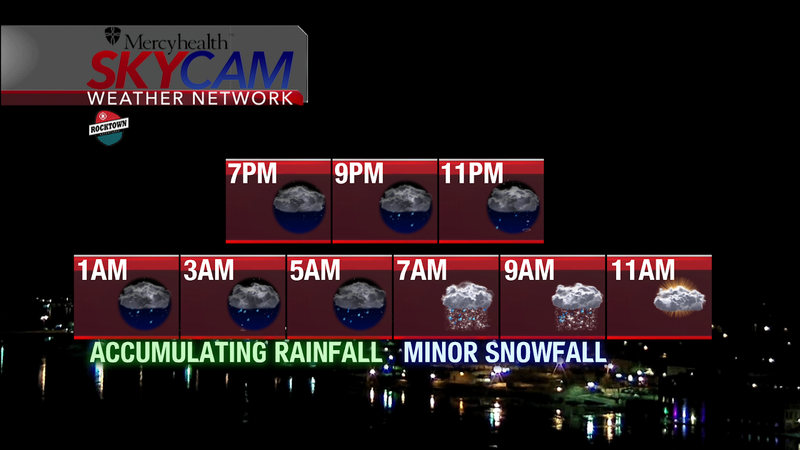 However, the heavier rain isn't expected to last long, and will die down once we get to around midnight. Once that low pressure system moves out Sunday morning, some dry air will settle in from the west, clearing out skies and bringing some warmer temperatures to end the weekend. We'll even maintain the sunshine and warmth heading into the work week, where temperatures will be near 50° Monday afternoon. 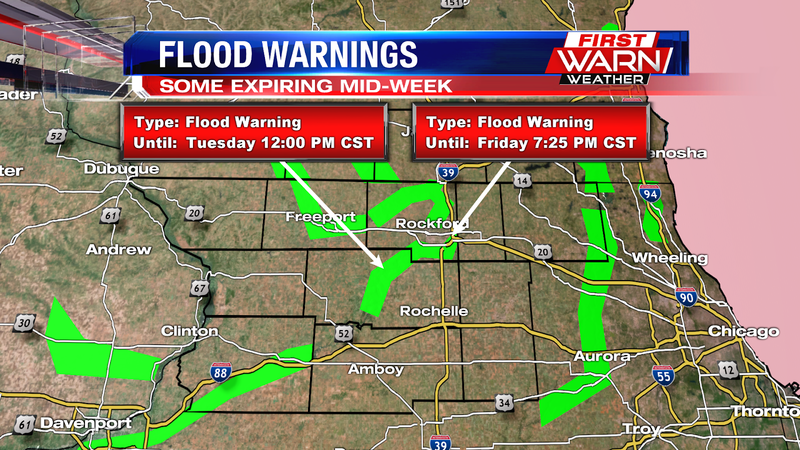 Do keep in mind that there are still multiple flood warnings across the Stateline. 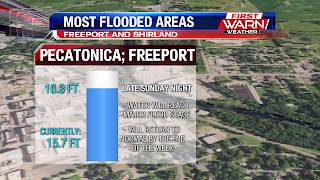 Luckily, many of these areas are starting to see water levels recede, but it'll take until the middle of next week for most of these areas to see regular water levels again. 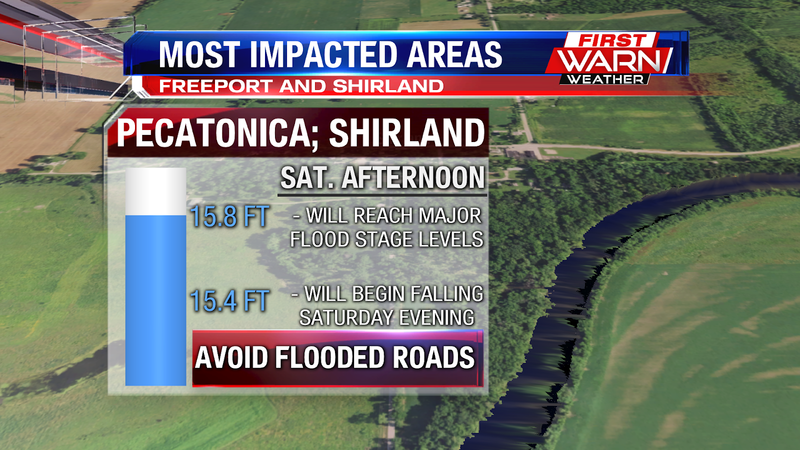 Two key areas that you'll still want to be cautious about are Freeport and Shirland, both along the Pecatonica River. 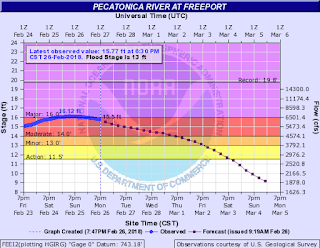 The Freeport area will see water levels crest at major flood stage levels Sunday morning, before falling back below its flood stage levels on Wednesday. 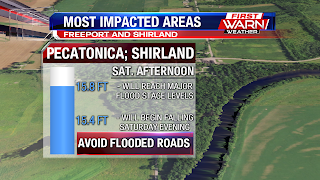 The Shirland area will see water levels crest at major flood stage levels Saturday afternoon, with water levels beginning to recede Saturday evening. However, this area will be seeing a very slow recession of water levels, and will take until the end of next week before water levels get below flood stage. 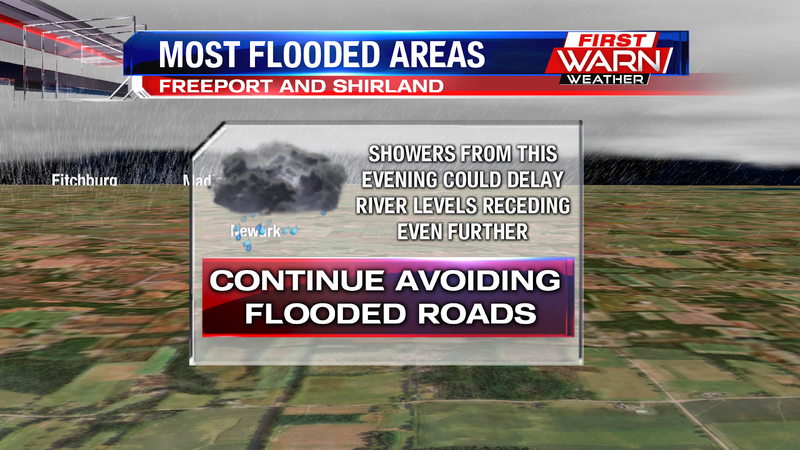 Above all else, avoid flooded roadways in these areas. TURN AROUND, DON'T DROWN! Rain Friday morning moved out of the area quickly, but left with it lower visibility due to fog. Around .1-.2" fell on the area, but there is more rain in the forecast for this weekend. 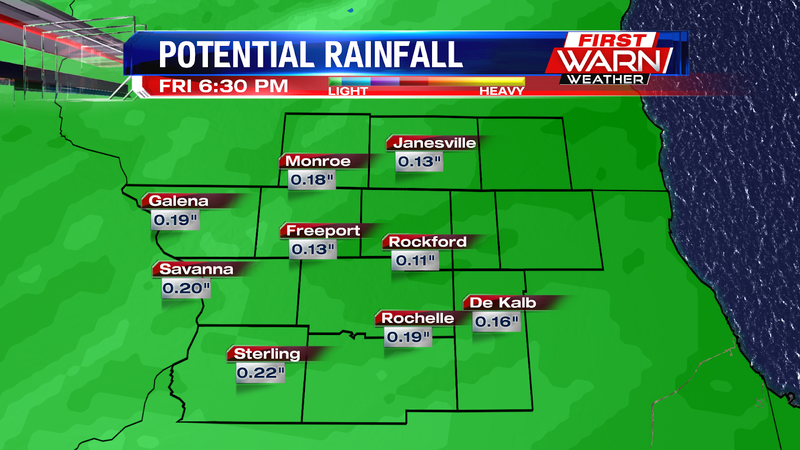 The rest of our Friday and Friday night will remain dry, but Saturday looks to be a bit soggy at times. A light mix is possible Saturday late morning with temperatures in the lower 30's ahead of a warm front to our south. Temperatures will quickly be climbing into the 40's for the afternoon though, so this will quickly turn to all rain early on. Showers will be light and scattered through the afternoon with minimal lift present. But with increasing instability Saturday evening, its possible for a few rumbles of thunder to take place as showers begin to increase in coverage and intensity. 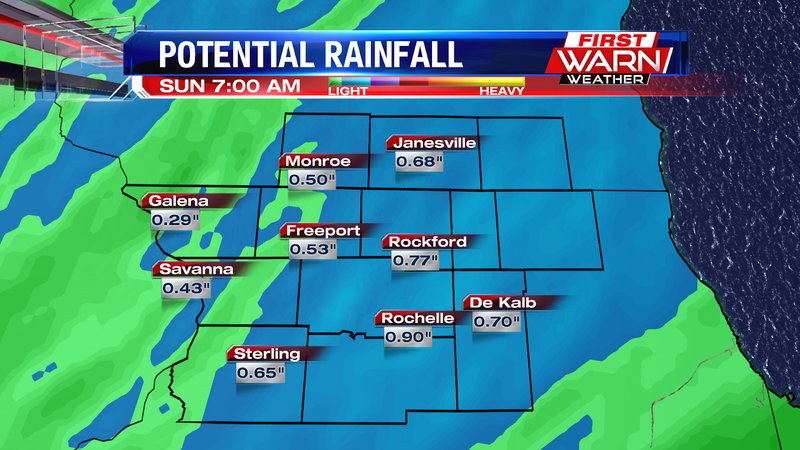 Moderate to even a few heavy rain showers will be possible Saturday evening and overnight. 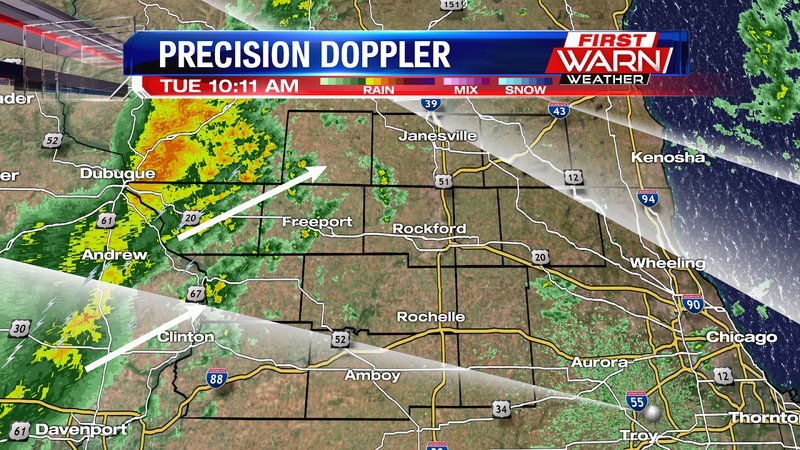 The threat for strong storms remains well to the south of the Stateline. 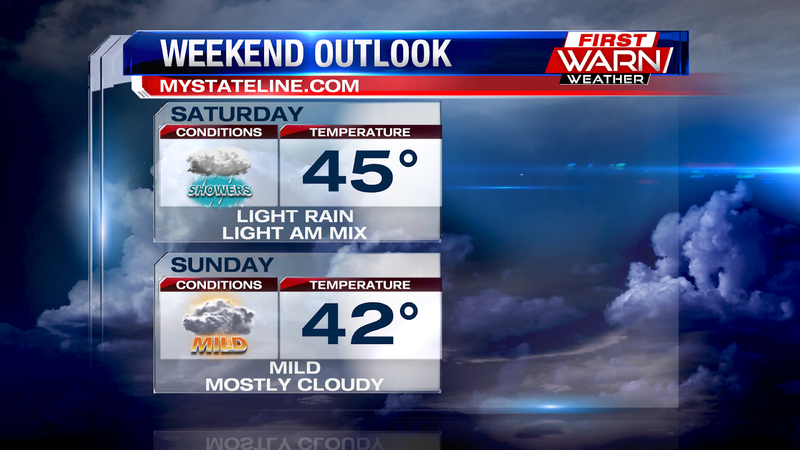 Temperatures through most of Saturday evening will remain well above freezing, so precipitation will remain all liquid. The cold front will bring an end to the rain in the overnight Saturday. A quarter to a half inch of rain will be possible though through Saturday and Saturday night, with most falling in the evening. 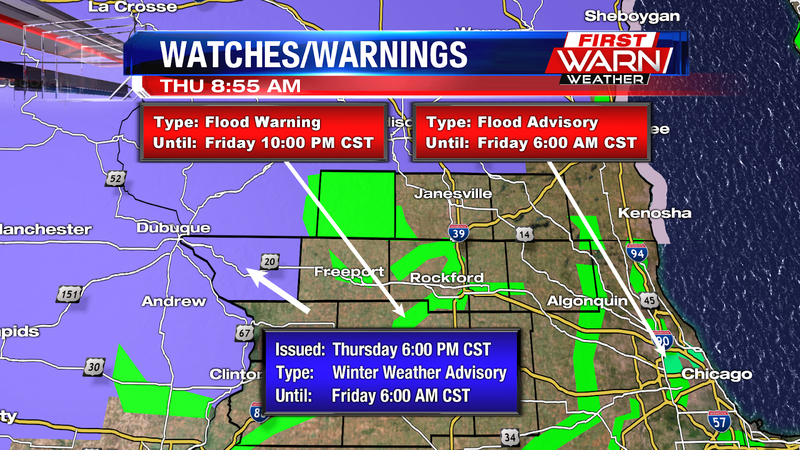 Minor to moderate flooding continues for the Rock, Pecatonica and Kishwaukee rivers Thursday evening. 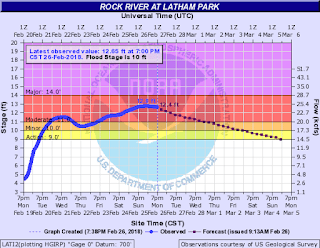 The Rock River at both Rockton and Latham have fallen to minor flood stage, but with anticipated rainfall Thursday night and Saturday the river level is expected to rise back into moderate flood stage this weekend. worse than what it was in July. 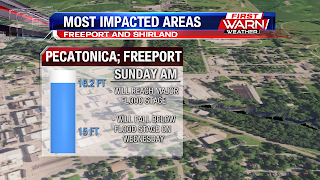 Flooding has hit the east side of Freeport exceptionally hard and with the river expected to crest at major flood stage sometime Saturday, the flooding may only get worse. 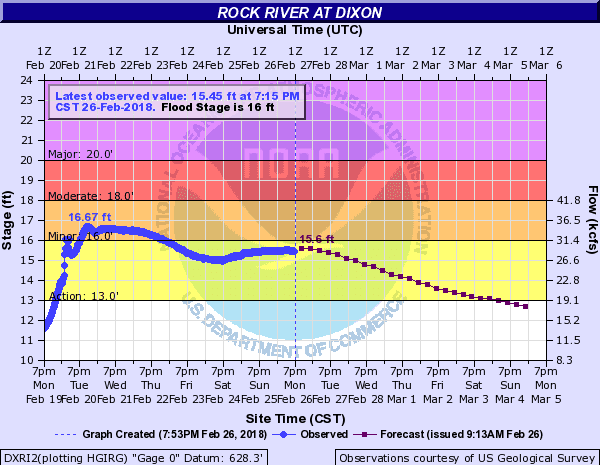 The good news is that the rainfall expected overnight Thursday isn't going to be enough to have an impact on the rivers. Anywhere between a tenth of an inch and quarter inch is expected to fall. Skies will quickly dry out, but remain cloudy, Friday. Temperatures warm into the low 40's. 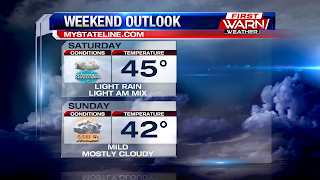 Another storm system is quick to move in Saturday and Saturday night. Initially there could be a little wintry mix early Saturday, but rain showers will develop late Saturday afternoon and evening with low pressure quickly approaching from the northwest. 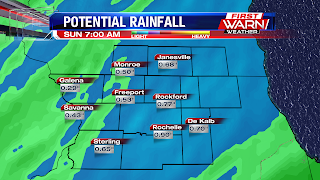 Rainfall totals with this system could be a little higher, between a quarter and half an inch, and could have a minor impact on the already swollen rivers. 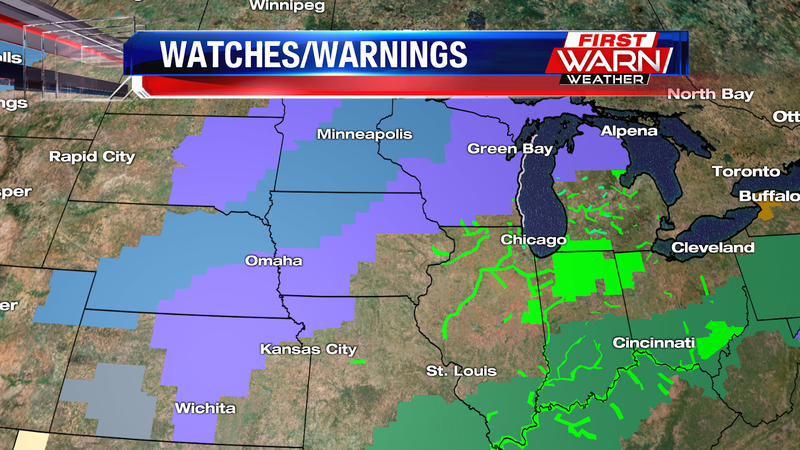 A Winter Weather Advisory has been issued for Green County in southern Wisconsin until 6am Wednesday morning. 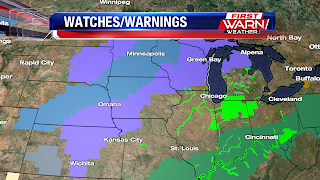 Winter Weather Advisories also extend up through Wisconsin, while Winter Storm Watches extend from northwest Wisconsin back down through Nebraska. A mixture of drizzle, sleet, snow and even freezing rain will fall primarily west of the white line from Oklahoma up through Green Bay, WI. There, temperatures at the surface will remain closer to freezing. Closer to home temperatures will warm into the mid and upper 30's allowing mostly rain to fall through Friday morning. 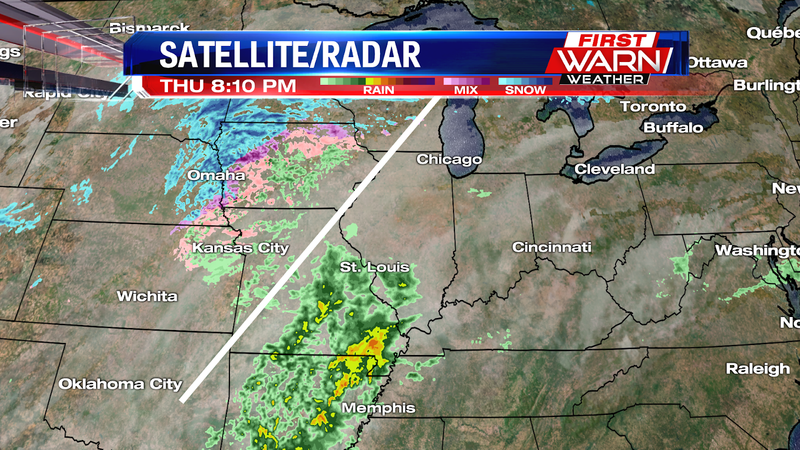 Rain showers continue to lift northeast from Missouri, reaching northern Illinois between 9pm and Midnight. Many Stateline rivers crested Wednesday at Moderate Flood Stage per the NWS, and will continue to drop over the next couple of days. This, along with the frozen ground created huge headaches for many with many flooded areas from the rain earlier this week. Most rivers are forecast to drop, but with a couple more rounds of rain expected into the weekend, it's some we'll need to watch. 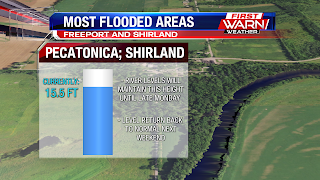 One area in particular is the Pecatonica River at Freeport and at Shirland. While the river level at these points will drop, they are forecast to crest again at (or just below) Major Flood Stage by Saturday. 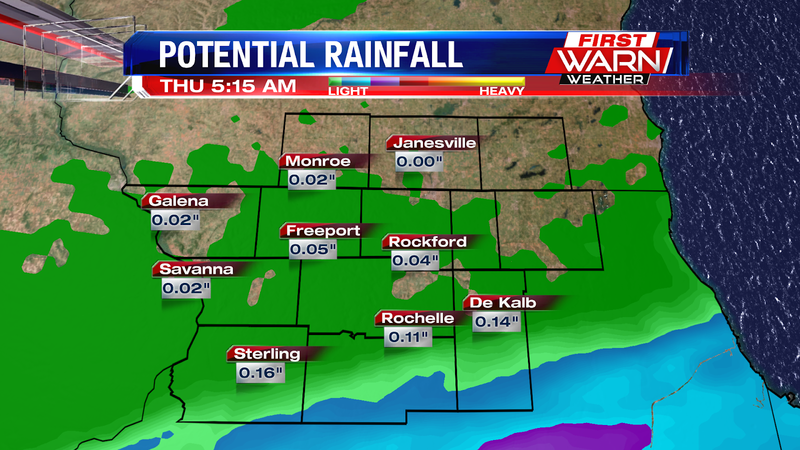 The first round of rain arrives this evening and will last through early Friday morning. The second round begins Saturday and will last into Sunday morning. By the end of the weekend, we could add another half an inch of rain to the rain gauge. It obviously won't be as much as what we received earlier in the week, but with some areas still flooded it will be something to watch. Light rain will be possible this afternoon, but we want to watch the threat for light freezing rain by this evening. Temperatures will be falling into the low 30's to near the freezing mark. This could allow for the rain to freeze on surfaces. Highest threat for now looks to be across southern Wisconsin and northwest portions of Illinois. Temperatures will climb overnight, so freezing rain shouldn't last long, and most will be waking up to all rain by tomorrow morning. 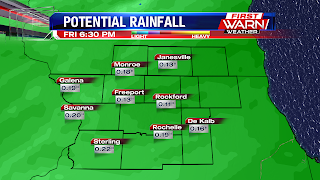 A front will pass, and conditions will dry quickly early Friday morning. 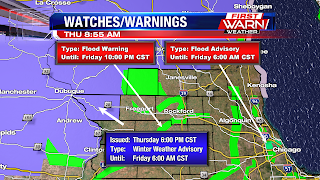 A Winter Weather Advisory will go into effect for Jo Daviess county tonight at 6pm through 6am Friday due to the threat of light snow and light freezing rain accumulations. This will cause some slick spots this evening. 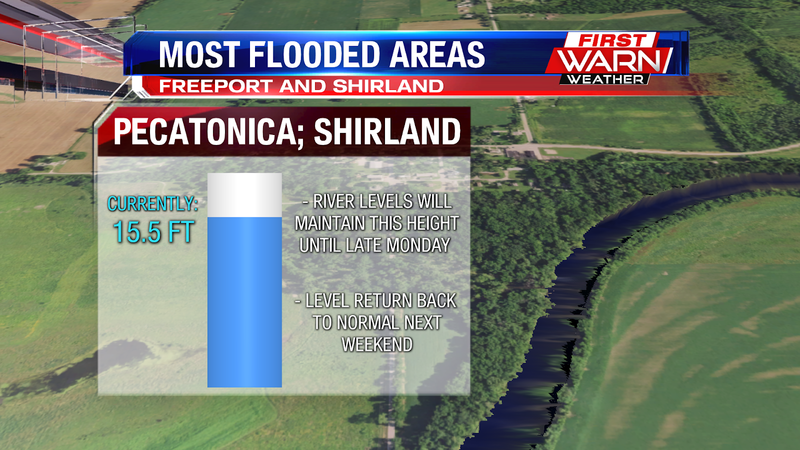 The rainfall may be done but the aftermath of the nearly three inches of rain will be felt for quite some time, especially on the local rivers. 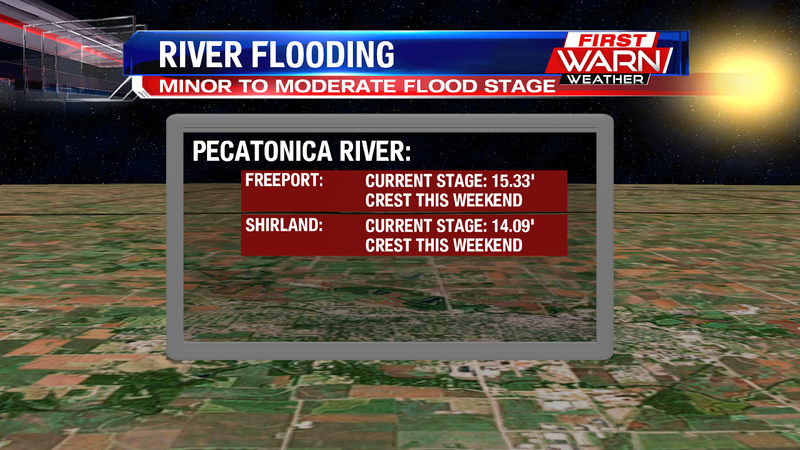 Both the Pecatonica and Rock Rivers are at moderate flood stage in several locations throughout northern Illinois. 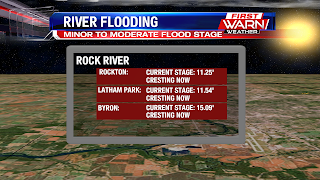 The Rock River at Rockton, Latham Park and Byron are all currently in moderate flood stage and causing quite a bit of flooding for residents who live along the river. 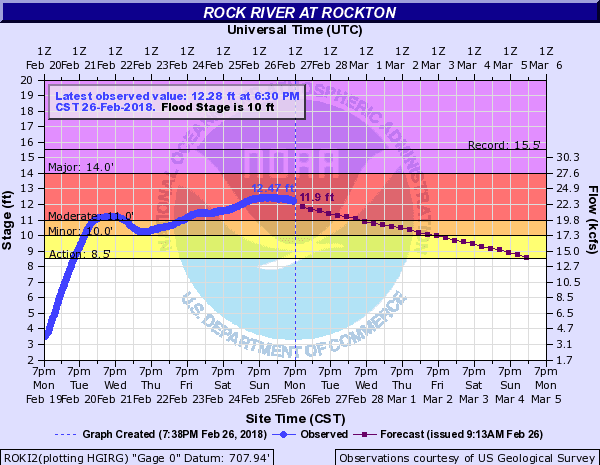 The Rock River at Rockton is currently at 11.25 feet and is cresting now. The river will fall to minor flood stage early Thursday and remain in minor flood stage through late Sunday night. 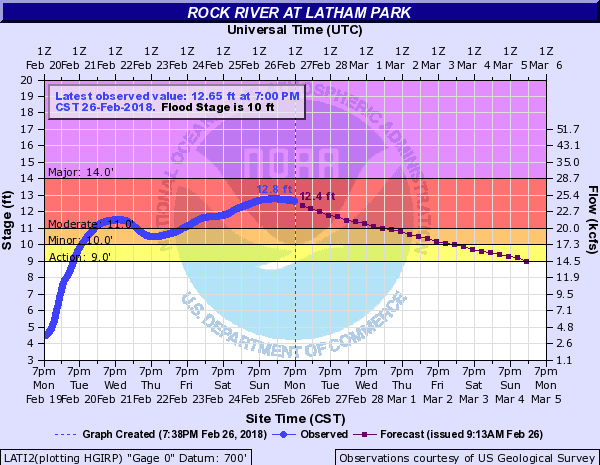 The Rock River at Latham Park is currently at 11.54 feet and will remain in moderate flood stage through Thursday evening. 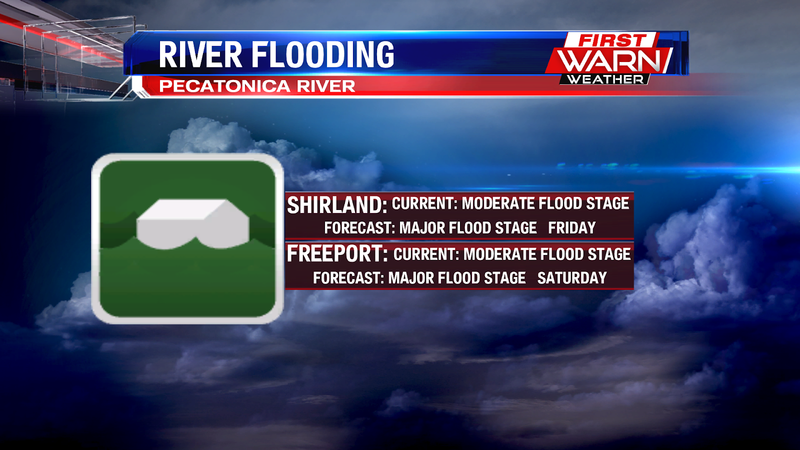 The river remain in minor flood stage through late Sunday night. 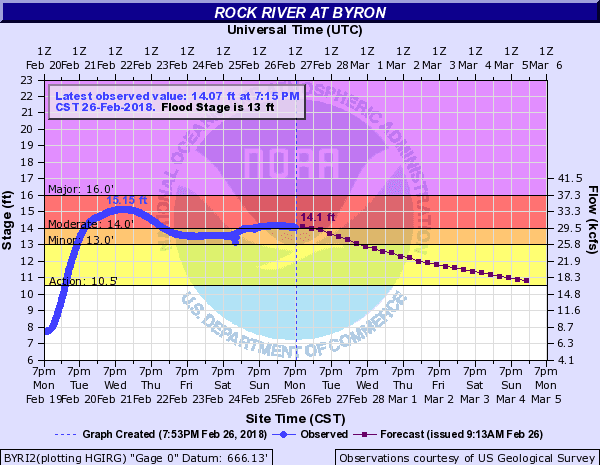 The Rock River at Byron is currently at 15.12 feet and is forecast to remain in moderate flood stage through early Friday, and in minor flood stage until Friday evening. 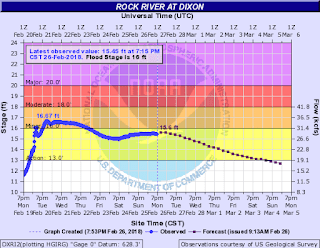 The Rock River in Dixon is currently at minor flood stage, with minor flooding to continue through Friday night. 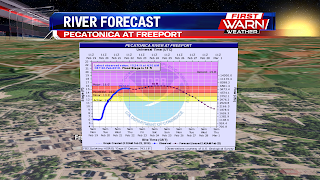 The Pecatonica River at Freeport is currently in moderate flood stage with the river level at 15.33 feet. The river will remain in moderate flood stage through the weekend, cresting near major flood stage just shy of 16 feet Sunday night. 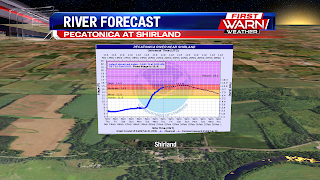 The Pecatonica River at Shirland is also experiencing moderate flooding with the current river level at 14.22 feet. 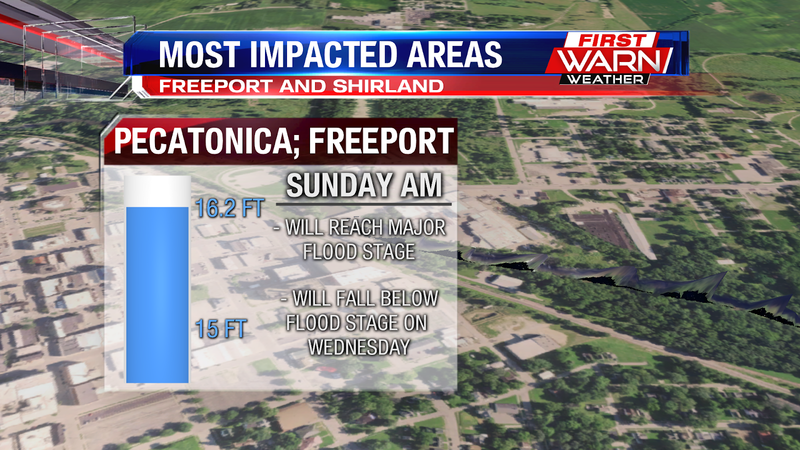 Like in Freeport, the river in this area will continue to rise, cresting a little below major flood stage late Sunday. The Kishwaukee River is also at moderate flood stage with a current level at 10.86 feet. 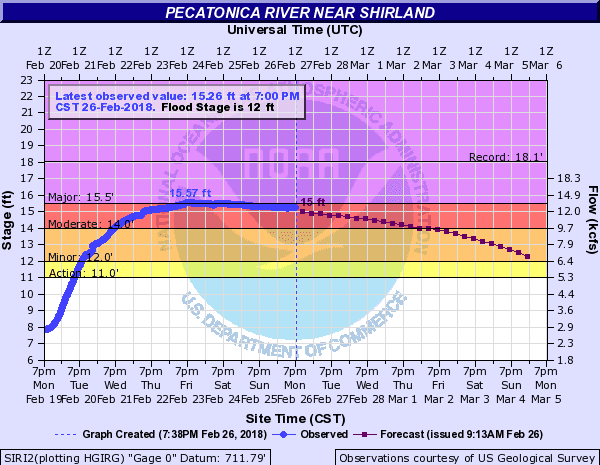 The river is currently cresting and is forecast to quickly drop down near active stage and below flood stage by Friday night. 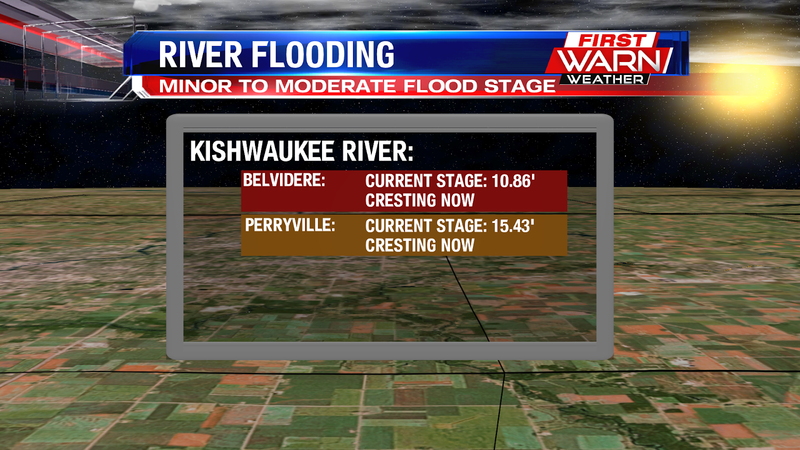 The Kishwaukee River at Perryville is also experiencing minor flooding with a current level at 15.43 feet. 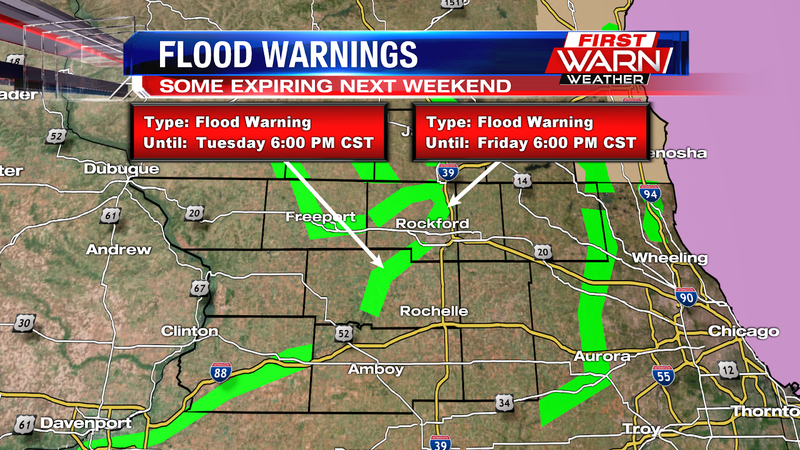 The river will also quickly fall below flood stage by the weekend. A Winter Weather Advisory is in effect for Lee and DeKalb counties until 3am Wednesday morning. A transition over to a mixture of snow, sleet and freezing rain has been showing up on radar but there have been very few reports of that actually reaching the surface just yet Tuesday evening. The threat for freezing rain and sleet isn't overly high, but is still present for areas south of Rockford and mostly over Lee and DeKalb counties. 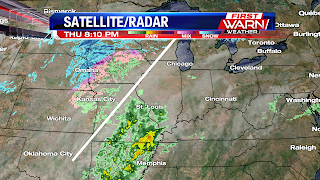 Most of the precipitation will have moved far enough east by Midnight to keep our skies relatively dry. Temperatures, however, continue their tumble into the low 30's and upper 20's. The combination of temperatures below freezing and wet surfaces could create some slick spots into Wednesday morning, most likely on elevated surfaces. Winds are also increasing from the Northwest and this may help dry some of the wet pavement into the overnight. Just take it slow Wednesday morning as black ice could be present. 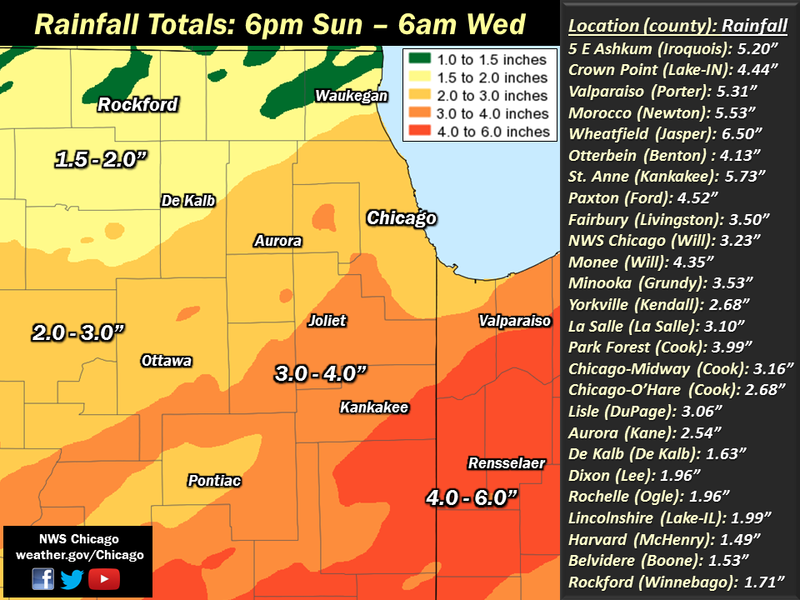 Widespread one to three inches of rain fell between Monday night and late Tuesday afternoon causing quite a bit of flooding in northern Illinois and southern Wisconsin. 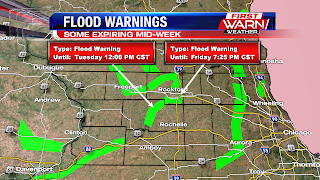 Several counties reported roads closed due to water and rising creeks, streams and rivers. 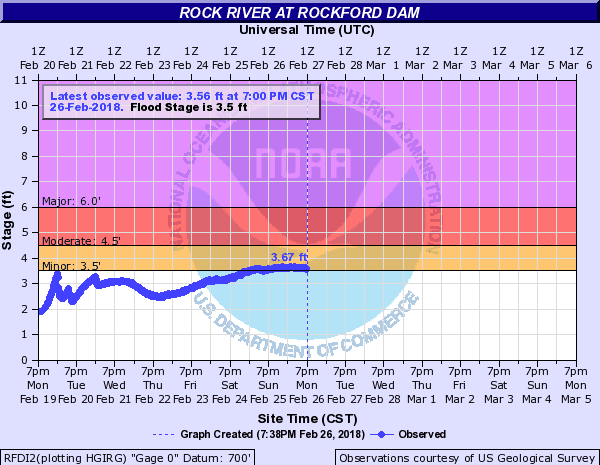 In Rockford 1.19 inches of rain fell, breaking the daily record rainfall for February 20th. 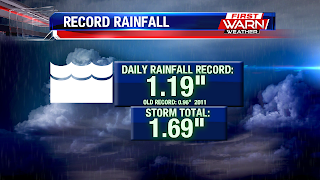 The previous record was 0.96 inches which was set back in 2011. Monday evening half an inch fell, bringing the storm total up to 1.69 inches! Another round of rain and thunder moving northeast - heavy rain at times. 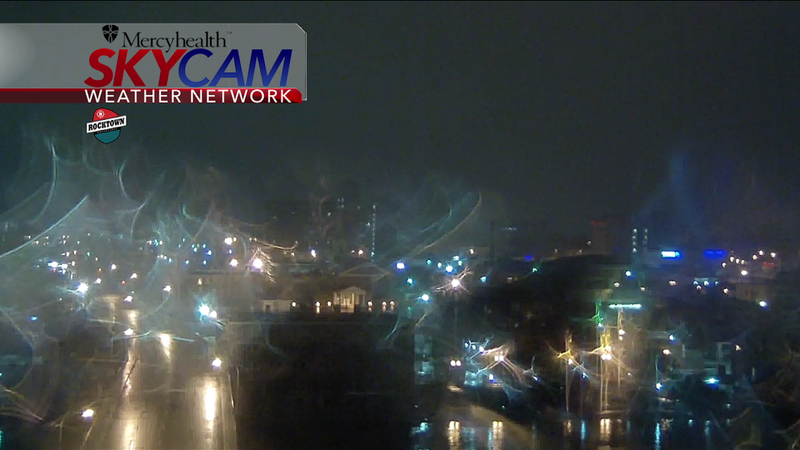 Watch for ponding on roads and minor flooding. 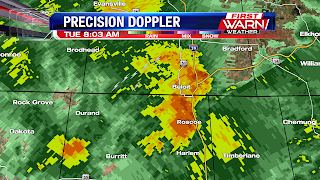 (6:35 AM) nwsbot: Local Storm Report by NWS LOT: Rochelle [Ogle Co, IL] co-op observer reports HEAVY RAIN of M1.25 INCH at 06:00 AM CST -- 24 hour rainfall. (8:19 AM) nwsbot: Local Storm Report by NWS DVN: 3 ENE Rock Falls [Whiteside Co, IL] trained spotter reports HEAVY RAIN of M1.25 INCH at 08:14 AM CST -- event total up to 7 am. 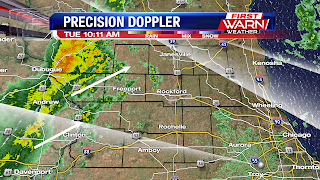 (8:33 AM) nwsbot: Local Storm Report by NWS DVN: 2 SSE Schapville [Jo Daviess Co, IL] trained spotter reports HEAVY RAIN of M1.84 INCH at 08:30 AM CST -- rainfall in the past 24 hours. 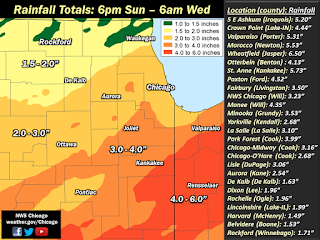 (5:29 AM) nwsbot: Local Storm Report by NWS LOT: Woodstock [Mchenry Co, IL] co-op observer reports HEAVY RAIN of M0.96 INCH at 05:00 AM CST -- 24 hour rainfall amount since 5 am monday. Heavy rain passing over Roscoe and Beloit this morning, adding to flooding concerns. Beloit Police saying "due to the extended rains causing flooding, McKinley is being closed between Burton and Newark. Remember turn around, don’t drown." 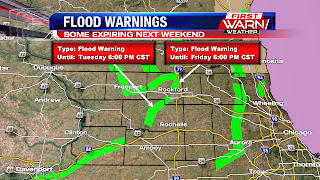 Flood warnings are still in place across southern Wisconsin this morning. 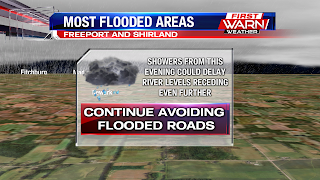 Be careful and watch for ponding and localized flooding! 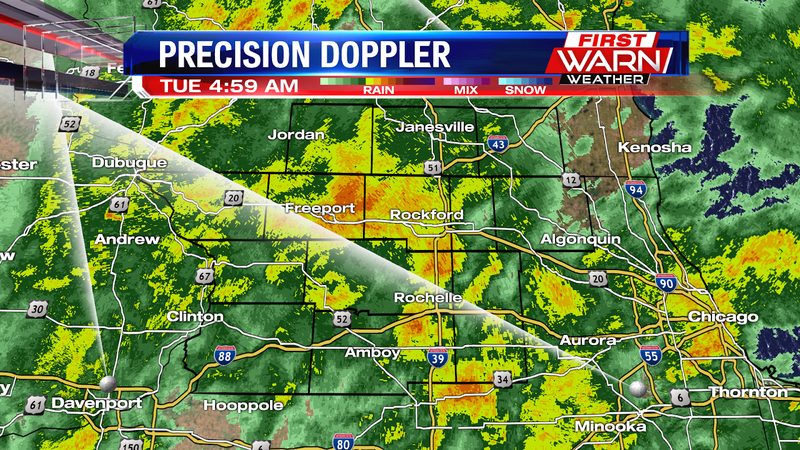 Embedded heavy rain within general area of showers this morning as you head out the door. 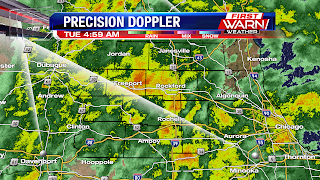 Rain will continue through the morning, with a break expected mid morning. With rain totals between .25" to 1" already this morning, from yesterday and overnight, you'll be running into standing water. As mentioned in the previous post, there has been water over some area roads in southern Wisconsin. 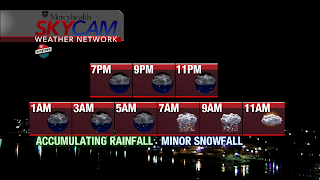 With the frozen ground, there is a lot of localized flooding and ponding in yards and some roads this morning. With more waves of rain expected this afternoon ahead of our cold front, the ponding and local flooding will continue to be a concern. 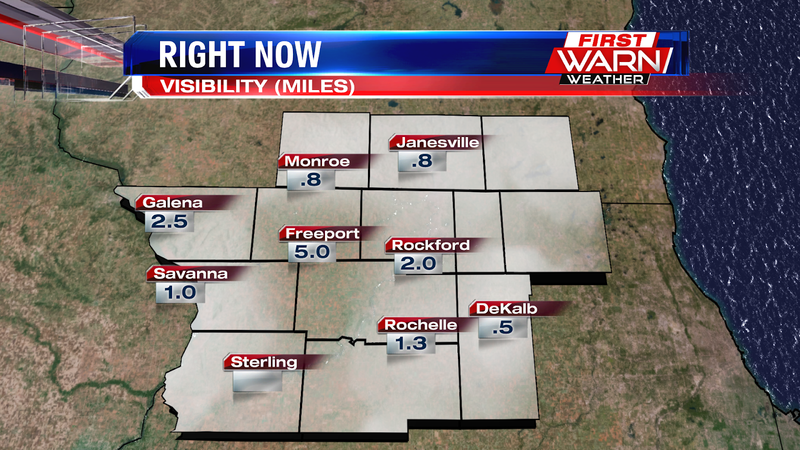 Along with the rain, fog is still an issue this morning. 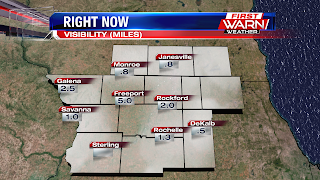 Northern Illinois is no longer under a dense fog advisory, but there are still areas of locally dense and thick fog. Fog will linger through the afternoon, until the cold front passes through.